Do you believe that collaboration helps Agile teams achieve great results? Do your team members collaborate less often than they could/should? If so, why? A common reason is that they do not expect the collaboration experience to be positive. It’s all about personal and interpersonal matters that, unfortunately, people would rather avoid than admit or deal with. Download our free Collaboration Etiquette poster. 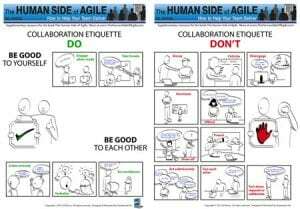 Demonstrating behavioural expectations around collaboration, this poster will make a good addition to your team’s working agreements. By helping the team amass positive collaboration experiences, it will facilitate the team’s move out of the Storming phase and into Norming. Simply enter your name and email to receive the printable poster plus a free subscription to Gil Broza’s 3P Vantage Point ezine, containing articles and news, and other Agile-related communication. You will always be able to stop receiving our communication. We will NEVER share, rent, or sell your information.